This is mostly a selection of musings from the unfathomed depths of my consciousness. Have a look at the bloggage I wrote on 23rd January. You can follow a link to it here. In particular have a look at the photo, and then compare it to this one. What’s different? You may not be able to see very clearly, but keep looking. Something is different. It’s not the number of birds, although that is technically a difference. There is one bird that is out of place. 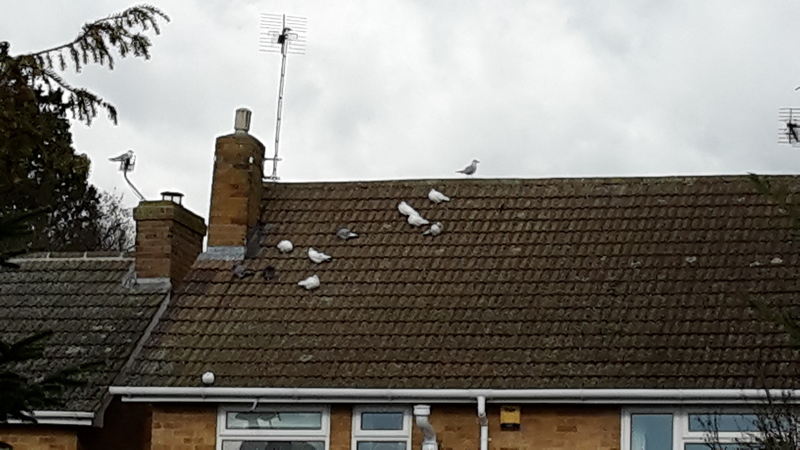 The one perched on the roof ridge is a seagull not a pigeon or dove. My daftness made me wonder why it is there. Does it want to join the club? Does it think that because there is a crowd something good must be going on so it’s joining in? Does it have aspirations to be a pigeon or a dove? Is it spying on them ready for a seagull takeover? Or was it just resting there en route to the nearest sea / refuse site? Of course some of you may be wondering why I seem to be spending all my time watching the roof of a nearby house! It’s a house we can see from the kitchen windows of our house so I observe it naturally when washing up or making a cup of coffee (I will let you decide which I do more frequently!). And if you can apply any of that to yourself, brilliant, if not I hope you enjoyed a brief foray into the impenetrable jungle that is my mind – this was written yesterday and scheduled for today because today I am going to enjoy a day off.